Hire Python developers (part-time or full-time) who are masters in working with Python 3.7.0 and Django, Flask and Web2py frameworks to reduce 60% operational costs via robust, dynamic, scalable and secure web/ mobile based business applications. Let’s Nurture is the ISO 9001:2015 certified Python development company with 6+ years of experience in offering business-driven solutions. Hire Senior Python developers who offer full-fledged services, be it scripts to complete enterprise web application solutions. We also provide server/infrastructure orchestration using open source software Ansible. The unparalleled expertise and experience of our Python programmers guarantee top-end Python development and maintenance services to an array of industries. 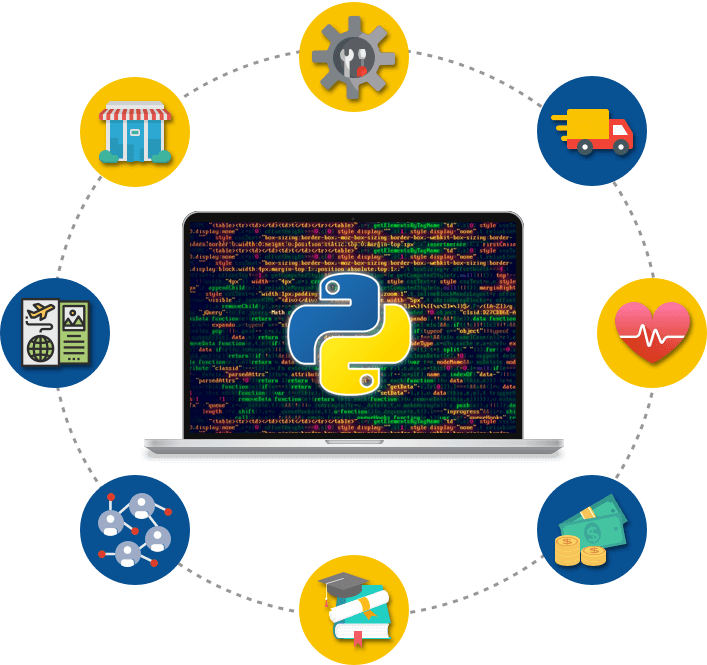 Python is the language of choice- be it Web Apps, IoT Apps, Machine Learning or AI used for E-commerce, Content Management, Shell Automation Programming or clones of On-demand marketplace applications like Uber, UberEats and so on. Hire Python developers from the best Python Development Company in India and gain the benefits of our expertise in frameworks like Django, Turbogears, Pylons, Web2py, Flask, and Pyramid. We are a top offshore Python development company in India, having offices in USA, Canada, UK, Singapore, and Australia. We aim to give right consultation services hire Python developers to our global clientele to finalize the strategic and architectural design for all Python-based application development projects. Our flexible engagement models compliment and serve the purpose perfectly. Let’s Nurture also offers staff augmentation services which allows our clients much needed flexibility to hire dedicated Python developers while having control over the Python development project cycle. Our flexible engagement models also allow us to communicate efficiently with our clients and deliver the end-to-end Python web and mobile app solutions in the best way possible. Onsite staffing services for dedicated Python developers to clients and companies within the same geographical border to fill gaps in the development cycle by frequent onsite visits or full-time presence at your place. We offer staffing services for dedicated Python programmers in countries like US, Canada, India, Singapore, and the Middle East for regular review meetings, system deployment or ongoing IT project development. Hire and employ Python developers to bring them at our offshore development center (ODC). We have a client-oriented process in which our project managers will keep you in loop in all communication channels with timely reporting. With expertise on Python 3.7.0 programming language, Python developers at Let’s Nurture deliver custom web and mobile app solutions using frameworks to solve complex tasks with ease. We use Django framework to develop and deploy powerful IoT based web applications to solve complex business processes. We also deploy small web applications with a quick turnaround time using Flask or Pyramid frameworks using Python programming. The range of Python development services provided by Let’s Nurture is shown below. Hire dedicated Python developers from a top-notch Python development company who are skilled to understand diverse business needs and help in offering the best tailor-made Python application development services. With Django and other frameworks, our Python development team builds dynamic, scalable, robust and secure websites, web applications, business intelligence, and analytics services. With best-in-class Python development services, we have successfully catered our clients from various industry domains to boost productivity with great ROI. We build high performing E-commerce app solutions along with e-carts, marketplace solutions, social commerce solutions and more. Our development team has experience in developing on demand training web apps, learning management systems, corporate learning portals and more. We have rich experience and portfolio in developing Python based web applications to bring social networks and communities together. We provide comprehensive Travel solutions with custom travel app development services for web and mobile (Android/ iOS) platforms. Our business driven web/ mobile app development services help logistics & transportation business to maximize RoI and effectively manage daily workflows. We are experts in providing end-to-end Smart Healthcare and mHealthcare solutions using multiple technologies like IoT, AI, AR-VR and more. Our innovative IoT based web and mobile apps help the automotive sector to be more cost efficient, easy to operate & sustainable for al long run. Python development team offers custom and high performing banking & financial software applications development with optimum security to handle large data. Why choose Let’s Nurture to Hire Dedicated Python Developers? Hire our senior Python developers and rest back easy as they are proficient in delivering powerful desktop/ mobile applications. The tools they use are Beautiful soup, Asyncio, South, Celery, Sqlalchemy, Factory boy, PyQt, Virtualenv. Our Python experts have full-fledged experience in working with frameworks like Django, Flask, Zope, Pyramid, Web2py, Tornado using libraries such as Request, Scrapy, wxPython and Pillow. Our Python developers have abundant experience in working with the latest tools, technologies and frameworks while keeping themselves updated to deliver quality Python based applications. Our Python experts provide FREE consultation to understand and deliver thoughts before development cycle starts. This is to ensure to deliver right app solutions as per client needs. No Python developer would be assigned without your prior approval. Our flexible engagement models will give you authority to get new apps developed in less time with quick team scaling. We adhere to strict NC/ NDAs for all client projects. Our systems are enabled with advanced security parameters with CCTV surveillance to secure information of your Python development project. IP ownership of the entire project remains with you from the day we start the engagement. Our contracts lay this out specifically to assuage concerns regarding eventual ownership. We provide reporting on daily, weekly, biweekly or monthly basis and update progress report on shared account on platforms like Zoho, JIRA, Slack with emails, Skype and UberConference. We conduct Extensive QA rounds to address all aspects of system performance Vis-à-vis. Once the project is delivered, we provide free technical support up to 3 months. We adopt on all the communication forums for staying connected through emails and Skype. We provide end-to-end Phyton development services regarding consulting, strategic development and UI/UX design, Phyton testing, delivery and deployment. Wish to hire Python Developers to build dynamic front-end and back-end applications? How can Python development add more value to my Business? Hire Python developers who can make tailor-made Python enterprise applications to create unique and engaging solutions. With the fact that business demands are rising everyday and loads of data is being transferred, Django framework will help in creating a custom, dynamic, robust, scalable and secure system that will reduce the operational cost and increase productivity. What steps I should follow to Hire a dedicated/ part-time Python developer from you? First of all - you should gather all the task for the developer which you want them to do for you. Based on the chosen developer and technology, finalize the agreement with sales team. Upon your confirmation, we will setup everything, and connect you & developer. Would I have the complete control over Project Development cycle if I hire Python development team? Yes. With “Hire a team” model, you will have a direct access to our Python development team. This business model is most advisable for CTO/ technical people and enterprise level firms who wants the constant changes in the system. What if I am not satisfied with the dedicated Python developer performance? Will you replace? Of course, we will have a look instantly and will provide you another developer along with having a conference with you in details to meet your expectations with utmost transparency. What is way to monitor and communicate the development of project with Python developer hired?